Sunday Noodle Salad | eating with S.O.L.E. While your noodles are soaking in warm water toast 1/2 a cup of seeds in a hot skillet with a dollop of olive oil, and a touch of sesame oil. Season with S+P, garlic powder, and chilli. toss and toast then set aside. Shred your root veggies, and dice anything else you want to add. If you are making your own Asian dressing we used grainy mustard and olive oil, along with Braggs and rice vinegar, and a hint of maple syrup, and it was lovely. Strain your noodles and cook them quickly in the hot pan you toasted the seeds in, coated well with vegetable oil, the trick is to keep them moving as the soften and get them seasoned; add S+P and 2 tsp ground Anise along with 3 tbsp + Braggs and about 2 tbsp of sesame oil. 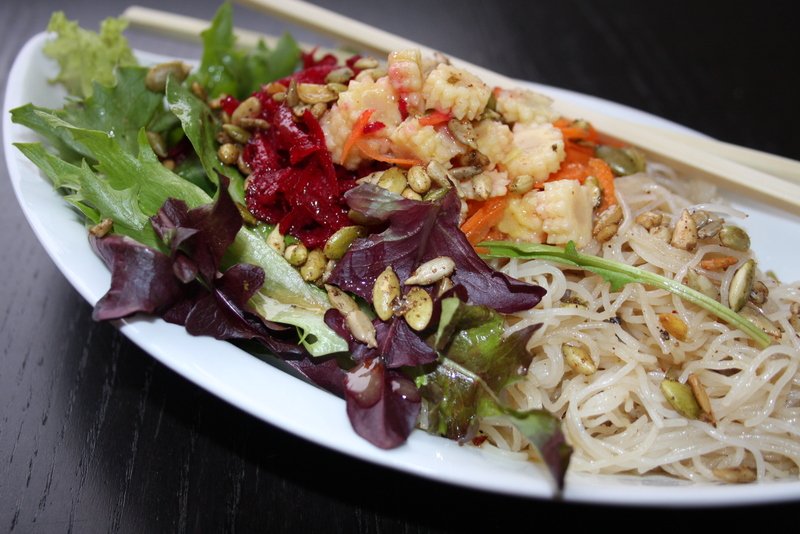 As soon as the noodles are soft remove from heat and you can start assembling your noodle salad, with veggies and dressing topped with the toasted seeds.